Dana-Farber/Brigham and Women's Cancer Center | 5 T-DM1 Trials Lead to Expanded Options for Patients with HER2-positive Breast Cancer Medical oncologists in the Susan F. Smith Center for Women's Cancers at Dana-Farber/Brigham and Women's Cancer Center are conducting trials of ado-trastuzumab em- tansine (T-DM1), a novel antibody-drug conjugate, to pro- vide new options for patients with early-stage HER2-positive breast cancer and enhance treatment response in patients with advanced disease. "We have led T-DM1 trials from the first early-phase study through its approval for patients with advanced HER2-pos- tive breast cancer last year," said Ian E. Krop, MD, PhD, Director of Breast Cancer Clinical Research at Dana-Farber/ Brigham and Women's Cancer Center. "Our current studies seek to extend this highly-effective and tolerable therapy to patients with early disease and strive to improve upon T-DM1's results in patients with advanced disease by com- bining it with other tailored agents." 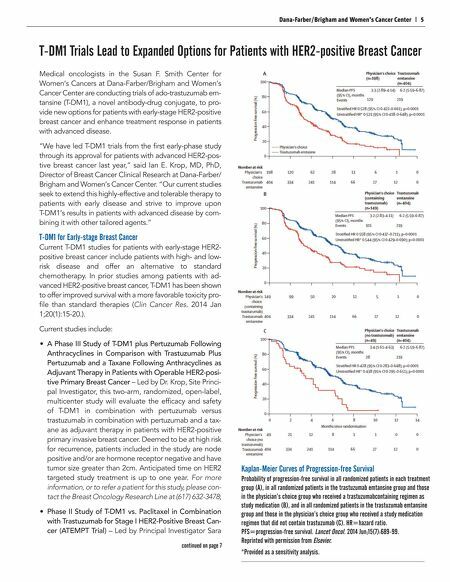 T-DM1 for Early-stage Breast Cancer Current T-DM1 studies for patients with early-stage HER2- positive breast cancer include patients with high- and low- risk disease and offer an alternative to standard chemotherapy. In prior studies among patients with ad- vanced HER2-positive breast cancer, T-DM1 has been shown to offer improved survival with a more favorable toxicity pro- file than standard therapies (Clin Cancer Res. 2014 Jan 1;20(1):15-20.). 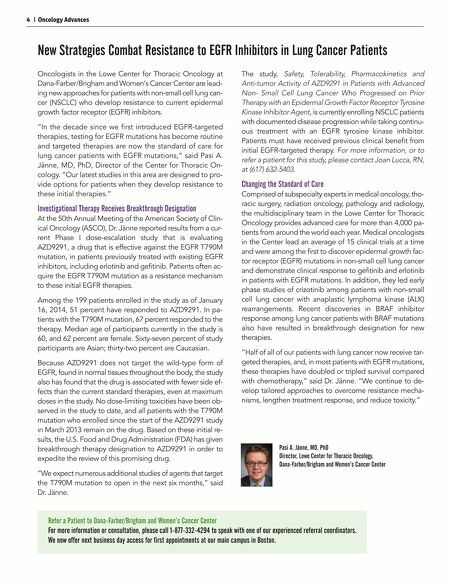 Current studies include: • A Phase III Study of T-DM1 plus Pertuzumab Following Anthracyclines in Comparison with Trastuzumab Plus Pertuzumab and a Taxane Following Anthracyclines as Adjuvant Therapy in Patients with Operable HER2-posi- tive Primary Breast Cancer – Led by Dr. Krop, Site Princi- pal Investigator, this two-arm, randomized, open-label, multicenter study will evaluate the efficacy and safety of T-DM1 in combination with pertuzumab versus trastuzumab in combination with pertuzumab and a tax- ane as adjuvant therapy in patients with HER2-positive primary invasive breast cancer. Deemed to be at high risk for recurrence, patients included in the study are node positive and/or are hormone receptor negative and have tumor size greater than 2cm. Anticipated time on HER2 targeted study treatment is up to one year. For more information, or to refer a patient for this study, please con- tact the Breast Oncology Research Line at (617) 632-3478; • Phase II Study of T-DM1 vs. Paclitaxel in Combination with Trastuzumab for Stage I HER2-Positive Breast Can- cer (ATEMPT Trial) – Led by Principal Investigator Sara continued on page 7 Kaplan-Meier Curves of Progression-free Survival Probability of progression-free survival in all randomized patients in each treatment group (A), in all randomized patients in the trastuzumab emtansine group and those in the physician's choice group who received a trastuzumabcontaining regimen as study medication (B), and in all randomized patients in the trastuzumab emtansine group and those in the physician's choice group who received a study medication regimen that did not contain trastuzumab (C). HR=hazard ratio. PFS=progression-free survival. Lancet Oncol. 2014 Jun;15(7):689-99. Reprinted with permission from Elsevier. *Provided as a sensitivity analysis.